I’ve recently returned from seeing Gravity at the local cinema (and really enjoyed it) so you can probably expect a review of that to hit the blog at some point tomorrow. For now though, I managed to watch The Dark Knight Returns Part 2 this Friday, and following on from Part 1, it delivers an even better second act that may just go down as one of my favourite ever animated movies. If the upcoming Batman/Superman movie that’s rumoured to be based off the storyline that unfolds here is going to be based off Frank Miller’s classic, then I can safely say that even if it’s half as good I will really enjoy it. Because The Dark Knight Returns’ second half was fantastic. Following on from the mutant brawl in the opening act that saw Batman barely dispatch the Mutant Leader, the mutant gang has now split in two – with several rebellious youth groups now calling themselves the Sons of Batman. And in Gotham City, things are about to get worse – when not only is the Joker released from prison to guest star as a host on a talk show (which is never a good idea), but also the New Police Commissioner seems heavily intent on bringing Batman down. 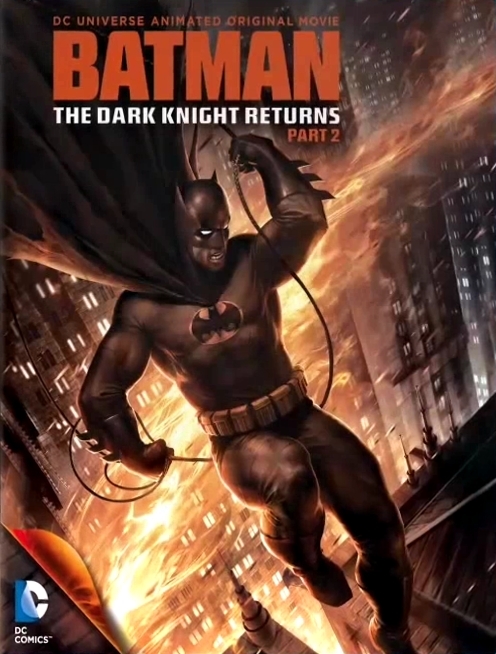 As it seems, so does everybody else – and the President calls in Superman himself to take Bruce Wayne down once and for all – and in the aftermath of the detonation of a nuclear bomb causing the city to plunge into a nuclear winter, the stage is set for the final battle between the Dark Knight and the Man of Steel. The Dark Knight Returns P2 excels the first in almost every way. The action scenes are better. The pace is better. The stakes are higher. There’s even an appearance by a one-armed Green Arrow, who is called in by Bruce to aid him in the fight against Superman. The emotional investment in this film is so great that the final outcome of the fight between Batman and Superman was handled exceptionally well. If Part 1 was good, Part 2 is a masterpiece. I flat out loved it. There are some notable differences from Part One in terms of character development as well. Batman (Peter Weller) and Robin (Ariel Winter) have become a lot closer in terms of partnership and Carrie Kelly has improved a lot in skill and ability as well. The same problems still linger though with the animation with Batman looking ridiculously large compared to Robin in size – but perhaps the greatest addition to this cast is the Joker, pulled off wonderfully by Michael Emerson in a very strong performance. The new female Chief Commissioner, Ellen Yindel (Maria Canals-Barrera) is pulled off very well as she turns her attention more on stopping the Batman as opposed to stopping actual crime – and of course, there’s the ever overbearing presence of Superman (Mark Valley) himself to round out the list of major players, thus making The Dark Knight Returns Part 2 a considerably lot more packed than its predecessor. Like Part One, Bob Goodman manages to remain true to the storyline but keeps it more tight and compact. There are fewer loose elements that bog down the narrative such as the Harvey Dent subplot – and whilst it still deals with two plots that take place one after the other – with the conflict with the Joker happening before the conflict with Superman and the Government, but unlike Part 1, Part 2 does a better job at connecting the two threads together. A highlight of Part Two for me was the interactions between Batman and various other characters. The banter between Batman and Robin was nailed pretty well indeed – as was his interaction between the Joker and Superman respectively, with the final showdown being executed tremendously well indeed, and easily remains one of the highlights of the entire storyline. However, there are a few minor problems. Firstly, the subplot concerning Yindel’s aggressive stance on Batman doesn’t really go anywhere and lacks any real resolution. The voice acting for the most part is stround with Winter, Valley and Emerson in particular doing pretty excellent jobs – but David Selby and Peter Weller don’t really work here as Gordon and Batman respectively. This is nothing strange from what we’ve seen from DC Animated Movies in the past – even a relative newcomer like myself is fully aware that the voice acting being hit and miss is common throughout most of them, with Justice League: Paradox being another example of this. So whilst a few plot threads may fall apart and the voice acting isn’t always spot on, The Dark Knight Returns P2 still remains a very strong and very awesome DC Animated Movie, improving and outclassing its predecessor very well indeed. And like P1, it comes highly recommended – a must watch for all fans of the caped crusader.